The primary purpose of an online project is to create and maintain a loyal base of audience or customers. You can reach your goal or touch your milestone depending on the support of your online fans and followers. So, you should take it as seriously as possible from the first day of your journey. The best way to deal with this fact is by building an easy and customized registration process. There are lots of WordPress user registration plugins out there that would enable you to manage your audience in a smart and better way. The question that would appear in your mind in this step is how to choose the best one? In this short post, we would introduce you with one of the top WordPress user registration and login plugin and how does it serve its users. So let's begin! Do You Really Need an ‘Extra' User Registration Plugin? While you are running a website, there are some facts and issues you need to consider with full priority. As a CMS platform, WordPress made it easy to build and design a blogging or business website. There are hundreds and thousands of plugins, themes or templates to personalize and customize your site. By implementing a perfect user management solution, you can ensure and increase your site's security and performance, manage product or blog posting, earning and more. Yes, WordPress user registration plugins let you perform all your regular tasks easily with securing your site and overall growth. Since WordPress offers a default user registration opportunity. So, why do you buy and install an extra user registration plugin? With lots of awesome features and facilities, WordPress also has a default or basic user registration option. From your site's general setting, you can allow your audience to register with their names or emails. Check out the image below. To activate this feature, simply go to your site's dashboard. Select settings, moving the mouse on General option, you would see a new page with some necessary fields. Now, just check the box of ‘Anyone can register' field and Save your settings. This would enable your user to register with their usernames and e-mails. Let's check out the process below. All your users' data will be stored in the User menu of your WordPress site's dashboard. This is how the default system of WordPress user registration works. But the problem is, using this process, you can collect only your users' emails, nothing else! Moreover, you can't treat or offer them something that would help them feel special. Here is when WordPress user registration plugin comes to the rescue. With a WordPress user registration plugin, you can collect more information and offer them extra spaces and scopes that would help you to create an actual user-friendly environment on your site. When your customers or readers would get something more than their expectations then that will make them feel special and they will start to engage and collaborate more on your site. This will get your dream of acquring loyal group of the audience! If you choose a registration plugin that offers a customized frontend solution, you can just be sure about your site's increased security. You may understand the fact that giving the first time users (strangers) direct access to your backend dashboard wouldn't be such a wise decision. So, a registration plugin with the frontend management solution wouldn't only make the usablity simple but would also ensure the security you want! It's been years sine WordPress User Frontend started its journey to serve the WordPress community around the globe. Today, over 20,000 organizations are actively using this solution to securely & effortlessly manage their audience's frontend posting on their sites. Not going for any more explanations, let's have a quick look at how to easily implement this plugin to register users and manage their activities. Before that, you should know that user registration and login is a pro feature of WordPress User Frontend. The plugin already has a free version with lots of wonderful features. But you need to buy one of its pro packages to use the registration and login option. It comes with a lot of handy features and over 20 useful modules. With WordPress, it's always easy to install and activate a new plugin or theme. Just go to your site's dashboard. It will redirect you to a new page with a beautiful search box. 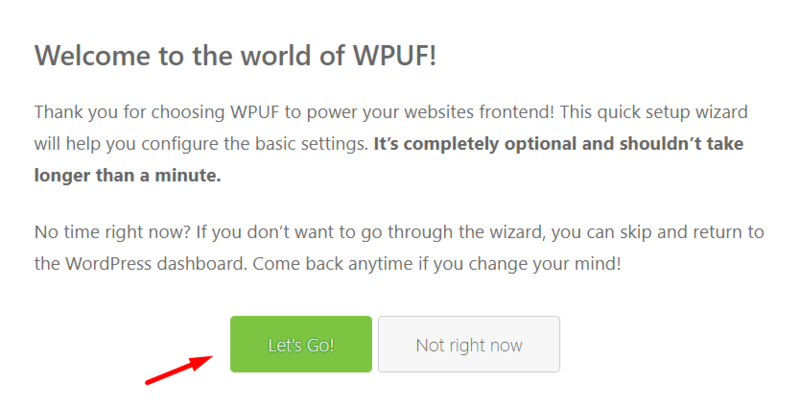 Write WordPress User frontend or WPUF. Soon you will find this awesome plugin. Now just simply install and activate it. After activating the plugin, you will get a welcome notice like below. Go ahead with the setting wizard. In the next step, you will see options to enable your payment for guest posting and get the necessary pages installed on your site's frontend. You can keep these unmarked if you don't want to enable these right now. 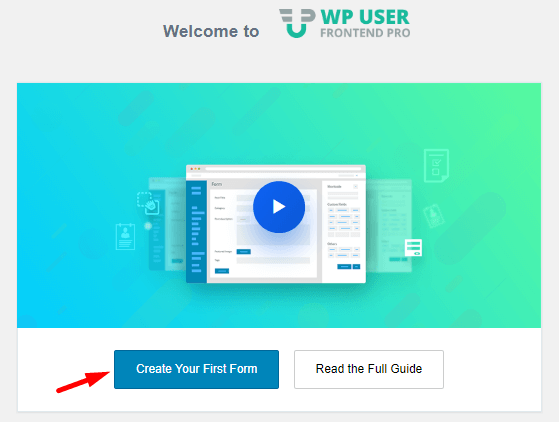 This is the page from where your journey of using WP User Frontend will start. You can begin your action by reading the full guide or creating your first form. 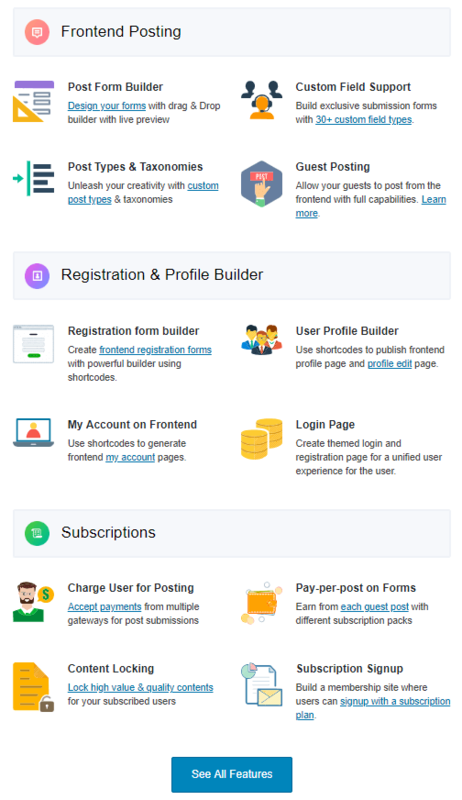 In this page, you could see the short overview on the basic features of WordPress User Frontend. 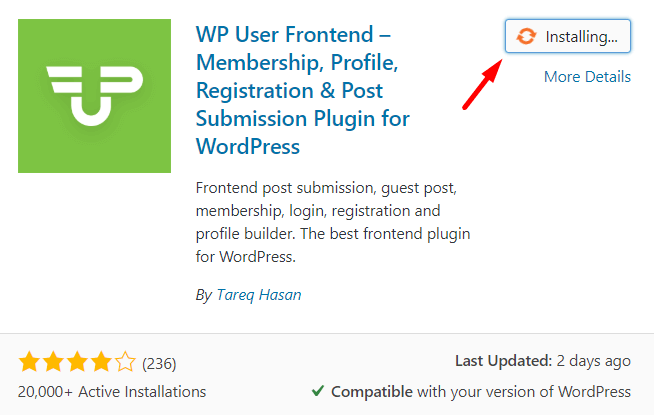 You have completed installing and activating the WordPress user registration plugin. Now is the time to get started with its final action. Follow this step by step guideline to add or create a new user registration and login page. You can build and customize your registration forms in no time. If you need, you can also follow this tutorial post. When you implement a user registration plugin, it actually helps both of you and your users in many ways. 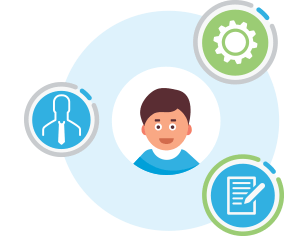 From an owner viewpoint, you can get to know who is coming to your site, collect their personal details, manage and monitor their activities, run a special program for them, set and maintain earnings, etc. With these, you also have opportunities like form building, subscription, different types of restrictions and more. On the other hand, a registered user can get facilities like an individual profile, adding or editing posts/products, making payments and getting updated all the time with relevant news and views. WordPress user registration plugins make it easier for you to connect, communicate and engage in a friendly way. And WordPress User Frontend is one of the easiest but powerful drag and drop form builder and frontend management solutions out there. Check out this tutorial video of setting up this plugin in your WordPress. Are you ready to make your decision? Let us know by commenting below if there is any question or confusion. We are always here to help you. Give a Try to WPUF Demo Now! Even after you paid for Dokan Pro Multi Vendor Plugins, do you still need this plugin as it seems the user subscription in Dokan Pro seems not to be working properly? Please do not misunderstand the main purpose of this post. Dokan and WP User Frontend is a totally different plugin and Dokan is good enough to go with its own features including the product form and the registration form. However, if you like to have more fields(Custom fields that WP doesn’t offer by default) on the vendor registration form or on the product upload form, you can do that with WPUF. This is something about extra benefits.